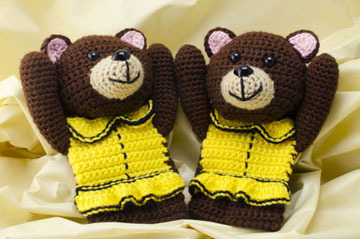 Our Bear Mitts are sure to be a hit with teenagers and young adults (or anyone who is “young-at-heart”!). They’re cute and stylish, plus they help to keep hands and wrists warm! Make your mitts with any color(s) of yarn you choose or use the same colors as our mitts. And why not embellish your bear mitts with buttons and bows for completely original mitts! The 16-page pattern includes written instructions for making each piece of the mitts, along with assembly instructions. Also included are many close up photos of the completed mitts, as well as the separate pieces. These mitts fit most teens and adults. The pattern is great for intermediate or adventurous beginning crocheters! Note: Photographed mitts were made with Caron Simply Soft yarn in #9750 Chocolate, #9606 Lemonade, #9703 Bone, #9719 Soft Pink and #9727 Black.